Finally, those interested in developing small scale wind projects should carefully review the information available under our Energy Basics webpage. How can I determine if wind is right for me? What are the principal advantages and drawbacks? Wyoming has a relatively abundant wind resource. Wind energy can be used for a variety of purposes, including off-grid residential systems and water pumping. Using electricity generated from wind can lower electric bills. The system will entail substantial upfront costs. Wind is an intermittent resource. 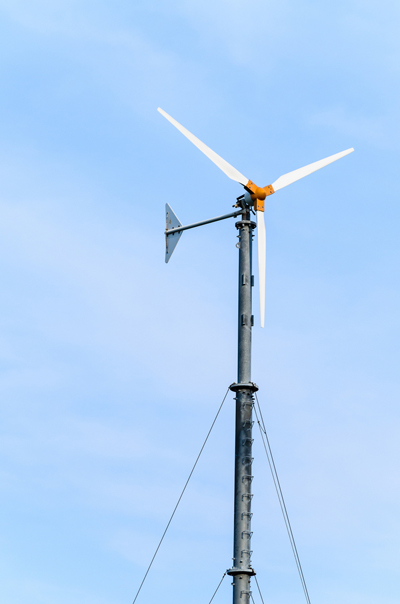 Because wind turbines can be obtrusive on the landscape, it may be necessary to seek neighbors’ approval before installation, and neighborhood codes and covenants should be reviewed before installing. For more information visit the DOE’s “Frequently Asked Questions on Small Wind Systems”. Does wind make sense for folks who want to live “off the grid”? You have a good wind resource (an average annual speed of at least 9 miles/hour), in addition to other energy resources. You are facing a grid connection that is not available or is very expensive. You want to use clean energy. Small wind systems, like other renewable energy sources are eligible for numerous federal and state incentives. Please visit our Incentives page for more information. How much does wind cost? The cost of installing a small wind system will depend on the amount of electricity you intend to generate with it. It generally costs between $3000 and $6000 per kilowatt of generating capacity. Costs vary greatly, so be certain to contact an installer for more accurate pricing. Where can I find a Wyoming-based contractor? Please see our list of Wyoming based contractors.